What is a transition town? What is its purpose, goals and how are they achieved? Transition towns are areas where a group of people comes together to become more self-sufficient and less dependent on oil and other resources that contribute to carbon footprints and climate change. Transition towns can alternatively be transition villages, transition cities, transition forests or transition islands. 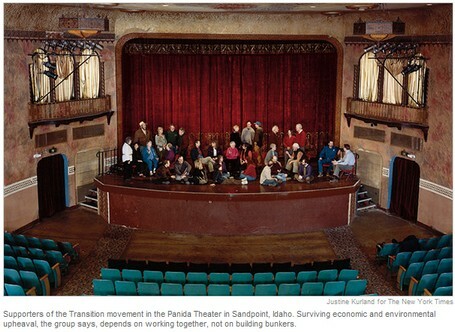 Find out what Rob Hopkins, “founder” of Transition Towns says about Transition US. -What do we need to sustain ourselves and thrive? -How can we alternatively meet our needs and reduce our dependence on oil? -How can we reduce carbon emissions in our community and therefore, mitigate the effects of climate change? Peak oil, greenhouse gas emissions and carbon footprints are big, worldwide problems. Instead of trying to change the whole world, transition towns attempt to change their own areas and their own environmental impacts. Transition towns aren’t waiting for governments to solve their problems but are reconnecting with their land and their neighbors to relearn how to live locally. Is there a transition town near you? There are many transition towns in Europe and Africa and now there are six transition towns in the United States including Sandpoint, Idaho and Montpellier, Vermont. Maybe you don’t live in or near a transition town or a local that is ready to unite and transition. There are still many pledges that you can adopt that will benefit your local community and ultimately the world. These commitments are about going green by going local. All of these goals work to relocalise and build not only sustainable but vibrant communities. We’ve watched out world getting bigger and bigger and more interdependent and there have been consequences. Commuting may seem a blessed option to the individual commuter but think of the greenhouse emissions. A kiwi fruit may seem a delectable treat but what did it take to get it to your local store? These are just two examples of why employing local, building local, growing local and buying local can help your town transition to reducing our carbon imprint and oil dependence. Are you ready to transition? It starts with an individual that is joined by a few neighbors and commits to encourage the local community. Transition towns are changing the world, one village at a time. am so greatfull to be come a member of green j i would like to oder some guied books,unfortunatly am jobless at moment,but am looking forword ro save some money for ,in fact you have improve my experience thanks to you all.